Arrow Slasher - Jungle Temples, and Village Blacksmith Forges. Disenchanting Saber - Strongholds (Specifically in Libraries), and Nether Fortresses. Haymaker - Dungeon, and Abandoned Mineshafts. Heart Piercer - Jungle Temples, and Desert Temples. Shield Breaker - Desert Temple, Village Blacksmith Forges. Sword of the Great End - End Cities. Sword Slicer - Igloos, and Nether Fortresses. Because these swords are extremely rare and unrepairable, players should use them if their abilities are applicable. The dormant fabled blades can be awakened, when their stored energy is enough to return them to their original prime power. The true name of the fabled blades also appear and cannot be changed. How to gather that fabled energy? For now, you'll need to figure it out because the documentations doesn't exist yet as of now. Each swords have abilities that makes them invaluable in various scenarios. Arrow Slasher - By default, 100% chance to slice arrows, effectively nullifies bow users. Disenchanting Saber - By default, 8% chance to disenchant (reduces level or removes the enchantment) enemies. Players' inventory is also subjected to be disenchanted (in other words, all of your 36 slots in your inventory). Haymaker - By default, knockbacks an enemy far away. Can be enchanted with knockback to drastically increase its knockback power. Heart Piercer - By default, attacks have 30% chance to apply heart pierced [status effect], and armor pierced [status effect]. Lunar Edge - By default, has an ability that can only be used at night time (right click to use, doesn't matter what lunar phase it is as long as it is at night time.). This ability makes you invisible and obtain Lunar attunement [status effect]. Attacking ends the invisibility and lunar attunement, but applies shattered hope [status effect] to your opponent. Shield Breaker - By default, has a passive ability to disable shields for a longer period of time than axes. Sword of the Great End - By default, each inflicted opponents are subjected to interfered [status effect]. 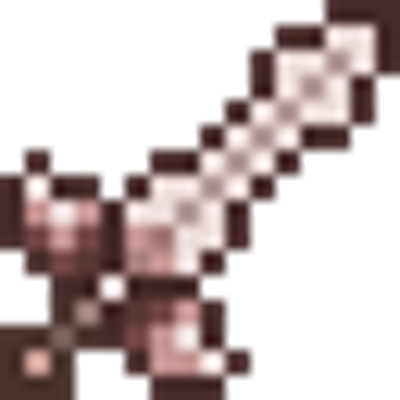 Sword Slicer - By default, attacks slices the opponent's main hand or offhand. By 'slice' it means it damages the opponent's item if ever it is damageable. If its not a sword, the 'slice' damage is doubled. Same applies to non-tool but damageable items ('slice' damage is doubled). When slicing non-tool, and items that are not damageable, it has a chance to reduce its stack count (or destroy it if it reaches zero) if it's stackable (cobblestones, wheat, and carrots are example of this) or slice it into pieces (still destroys it) if it's not stackable (examples includes but not limited to potions, water, and lava buckets, enchanted book, and etc.). These status effects are only obtainable through hacks, nbteditors, or being slashed by a particular sword. Armor Pierced - By default, each level removes 25% armor and armor toughness to those who are inflicted with this status effect. Heart Pierced - Severely cripples health regeneration (health gain/regeneration is divided by 10) and by default, damages whoever has this status effect. Interfered - For endermen, unable to teleport normally. Can only teleport when attacked with bow or in contact with water. Players who are affected with this cannot teleport using an ender pearl. Used ender pearl will not be refunded. Lunar attunement - Players who have this status effect will lose their invisibility, and this status effect when they attack. Attacking with this status effect applies shattered hope [status effect] to that inflicted opponent. Shattered Hope - Reduces damage output (not just melee damage, for example, using a fully charged arrow fired from a bow. ), and attack speed to whoever has this status effect. Almost every aspect of the mod is configurable. For more information, head to its config file. Some of the sword's tooltip also changes if configured (in V2.0.0, tooltip is now a lore of the fabled blades). Lastly, feel free to leave comments. Criticize what must be criticize, or just say your opinion. So how exactly do you awaken these swords? It's been almost 3 months and you havent updated on how to get this energy. Life business tends to get in my way. I love the different mechanics for all the weapons! Brings a fresh breath of air in a world of mods that all feel the same! Cool mod. Is it allowed in modpacks? Looking forward to adding this to a 1.12 server someday though! Awesome! Suprised something like this hasn't been made before. Hot dang! This looks pretty sweet! This seems really cool! Nice one!